Eric Thompson's strong, melodic picking has set a benchmark for taste and tone for nearly four decades. 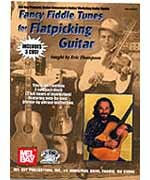 Eric teaches 16 of his favorite old-time fiddle tunes, which are the bedrock upon which acoustic guitar flatpicking is built. They are all included in the 32-page book and three companion CDs of note-by-note, phrase-by-phrase instruction. Some of the classics included are "Blackberry Blossom", "Ragtime Annie", "Texas Gals", "Billy in the Lowland", and many more. In three easy lessons, Eric will have you playing fiddle tunes and building your repertoire in no time!